The area in the north-west part of Rheine which encompasses the Salinenpark, the neighbouring zoo as well as Bentlage monastery and cultural landscape is an interesting place to visit. The Salinenpark was redesigned in 2004. Today, box-shaped linden trees create a focus at the central part of the graduation house where the original structure is missing. Extensive information can been obtained from the visitor centre. The central themes of “nature”, “culture” and “salt”, known together as the “Rheiner Dreiklang” (Rheine Trio”), are used to guide visitors through the area. The salt route passes through the park at the Gottesgabe salina and past the restored graduation house. The practice of extracting salt in the 18th and 19th centuries is explained here. The nature route passes through Bentlager Busch (Bentlage Wood). Here fauna and flora are explained along with the Tanzlinde – a 160-year-old linden tree, the loop in the Ems river, which is a dominant feature of the landscape at Bentlage, and the Wegefächer, which portray aesthetic landscape design. The monastery is the cultural centre of Bentlage. It forms an important part of the cultural route, which explains the history, architecture and development of the monastery throughout the centuries. The “Gottesgabe” salina is unique in the Münsterland and can be found in the north-west part of Rheine, a town on the Ems river. Located at the edge of Bentlage monastery with its rich historical cultural landscape, the salina, its graduation house and the salt baths together with the neighbouring zoo are popular destinations for outings with young and old alike. In the 18th and 19th centuries, the salina experienced the heyday of its almost 1000-year history. The technological structures which have survived from that period are now cultural monuments and are well worth seeing. 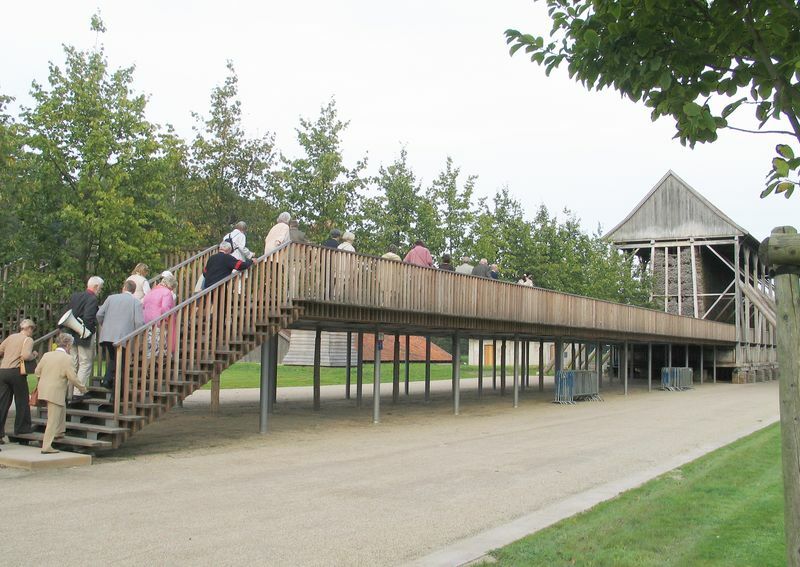 The Salinenpark was redesigned for the REGIONALE 2004. Today, box-shaped linden trees create a structural focus at the central part of the graduation house where the original structure is missing. Extensive information can be obtained from the visitor centre. Trained guides use the central themes of “nature”, “culture” and “salt” to show visitors around the large area. Together, these themes are known as the “Rheiner Dreiklang”. The nature route passes through Bentlager Busch (Bentlage Wood). Here fauna and flora are explained along with the Tanzlinde – a 160-year-old linden tree, the loop in the Ems river, which is a dominant feature of the landscape at Bentlage, and the Wegefächer, which portray aesthetic landscape design. The nature route is the longest of the three routes. Because its various stations are far apart, guided tours by bike are on offer. The old gardens and parks belonging to the salina and the salt baths were redesigned several times over the years. It seems probable that a Tanzlinde was planted at the salina inspector’s residence as far back as the 18th century. Certainly, the regular form created by the horizontally-cut branches of comparable linden trees was sometimes fitted with wooden boards for dancing at events in the past. The old linden tree is today a rare natural monument. There were several gardens on the terrain of the salina. These were surrounded by hedges and were probably used as kitchen gardens. In addition, a special feature of the terrain was the existence of halophytes. These plants, which are otherwise only found in large numbers in salty fields at the coast, are severely endangered in many places or have already almost died out. The creation of a spa park only took place in 1897 with the development of the salt baths. At the beginning of the 20th century, the area at the spa rooms and the bathhouse was designed as a landscape park with curved paths, selected shrubs and trees and colourful flowerbeds. The focal point of the park was formed by a large pond which could be crossed by a bridge. 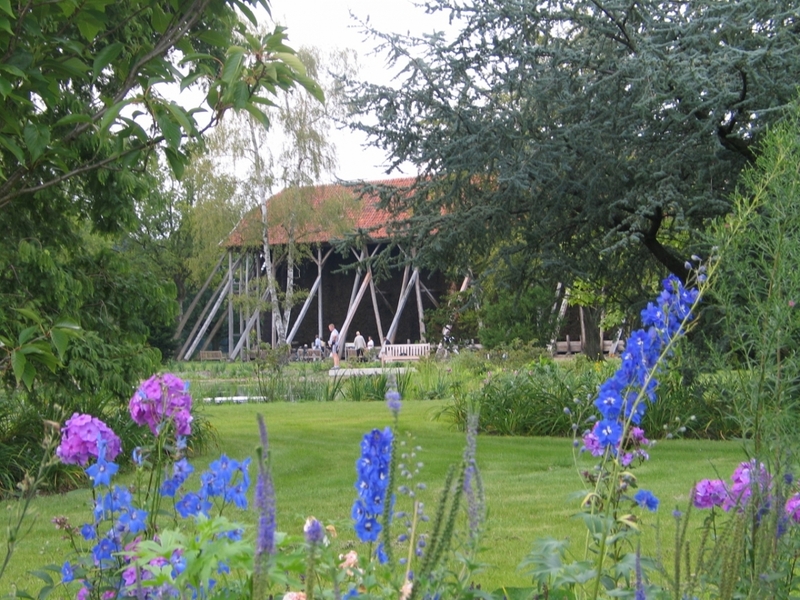 A wooden music pavilion enhanced the park to the east of the spa rooms. The gardens at the salt baths became a kind of “showcase” for the town in the following years and were used as a motif for numerous greeting cards sent all over the world by post. The terrain around the graduation house formed part of the design of the spa park until the opening of the zoo in 1939. In 1946, severe flooding from the Ems river caused extensive damage to numerous buildings and to the park. In the seventies, the central area of the park was covered over as a result of an extension built onto the south end of the Gertrudenstift (Convent of St Gertrude). In recent decades, the remaining outside areas of the salina and salt baths have been redesigned by the municipal Grünflächenamt, which is responsible for the care of green spaces. The central element of design here is the axis of the missing central part of the graduation house, which is accentuated by planted beds with walls of natural stone, roses and shrubs as well as trimmed yews. The radical new planning of the Salinenpark which was carried out for the REGIONALE 2004 added greatly to the attractiveness of the ensemble, which is of particular significance for Rheine. As a modern space for leisure and recreation, the new Salinenpark covers a wide range of uses. Bus: Bus no. “C4 Saline/Tierpark“ from the bus station as far as Saline/Tierpark bus stop. Bus leaves every 30 minutes.